The final confirmation vote will likely be on Saturday. In a much-anticipated speech on the chamber floor Friday, Sen. Susan Collins made the case to vote for Brett Kavanaugh to become a Supreme Court Justice – throwing her support as a moderate behind President Donald Trump's pick. The Maine Republican's support is seen as a critical step in the protracted confirmation process – a fight which has highlighted complicated partisan politics and the #MeToo movement. It's still unclear if Senate Republican Leader Mitch McConnell has the votes to get President Donald Trump's Supreme Court nominee confirmed. A final Senate vote is likely Saturday afternoon. Earlier in the day, Republicans needed and netted a simple majority of 51 votes to invoke cloture — to end debate and set up a final vote. The response to the dramatic cloture vote on Friday was swift on social media including tweets from political luminaries from political cycles past. Former President George H.W. Bush, a part-time resident of Maine, applauded Sen. Susan Collins' support of Brett Kavanaugh. Former Republican Vice Presidential candidate Sarah Palin quipped about fellow Alaskan Sen. Lisa Murkowski's political prospects. And former Obama-era National Security Adviser Susan Rice's pithy response to former White House Communications Director Jen Psaki. Rice later clarified she was not making any announcement about a candidacy bid. Conservative pundit and radio Laura Ingraham also tweeted that she likes Alaska a lot, and may not mind working there, ABC News' Rick Klein reports. 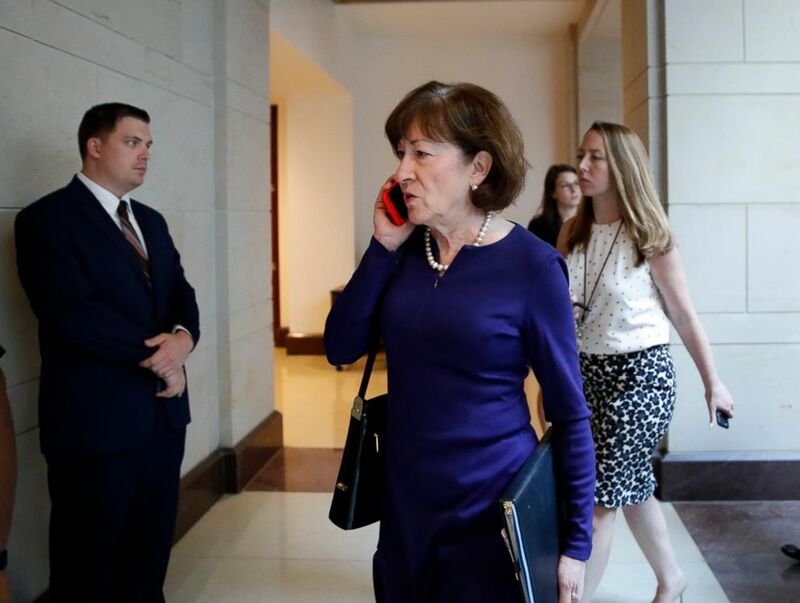 3:47 p.m.: Sen. Collins: "One can only hope that the Kavanaugh nomination is where the process has finally hit rock bottom"
Moderate Maine Republican Sen. Susan Collins threw her weight behind President Donald Trump's Supreme Court pick and offered a lengthy and, at times emotional, case to vote for Brett Kavanaugh. Collins said she found California professor Christine Blasey Ford's testimony "sincere, painful and compelling" as she detailed her allegations of sexual assault against Kavanaugh. The senator stressed that she believes Ford to be a survivor of a sexual assault. However, Collins stressed, questions about fairness and due process must also be considered. "The Senate confirmation process is not a trial," Collins said. "But certain fundamental legal principles about due process, the presumption of innocence, and fairness do bear on my thinking, and I cannot abandon them." Collins lamented the acrimonious debate surrounding the confirmation process and hoped that this would be a low point in history. "Our Supreme Court confirmation process has been in steady decline for more than 30 years," Collins said. "One can only hope that the Kavanaugh nomination is where the process has finally hit rock bottom." Before her speech, protesters could be overheard chanting "Vote no! Show up for Maine women! Vote no! Show up for Maine women!" Collins said she did not want her support for Kavanaugh's confirmation to be misconstrued as not listening to the voices of women. She also argued that previous justices appointed by Republican presidents authored a decision reaffirming Roe v. Wade, despite pro-choice opposition to their confirmation. West Virginia Democrat, Sen. Joe Manchin, another key vote, also tweeted that he too would support Kavanaugh's confirmation. While Manchin said he has "reservations about this vote given the serious accusations against Judge Kavanaugh and the temperament he displayed in the hearing", the judge is a "qualified jurist." "Based on all of the information I have available to me, including the recently completed FBI report, I have found Judge Kavanaugh to be a qualified jurist who will follow the Constitution and determine cases based on the legal findings before him," Manchin said in a statement. Manchin said he met with Kavanaugh for more than two hours, attended his hearings, spoke with constitutional experts and heard from thousands of West Virginians which ultimately led him to his decision. Press secretary Sarah Sanders said in a Fox News interview that the White House is "optimistic" that Kavanaugh will be confirmed. "We feel great about where we are right now," Sanders said. She added that the White House "looks forward to seeing him [Kavanaugh] confirmed later this weekend" despite the fact the margin to move forward was so narrow. "We would love to see all 100 senators get behind and support Judge Kavanaugh, but we think the vote that took place this morning was certainly a step in the right direction," Sanders said. President Trump is currently in contact with a number of senators, she said, and the White House plans to tune into Republican Sen. Susan Collins' floor speech at 3 p.m. Collins said earlier Friday that she would announce her final vote in that speech — and that could prove key to whether Kavanaugh gets confirmed. Republican Sen. Steve Daines of Montana has a conflict: He is supposed to walk his daughter down the aisle at her wedding on Saturday, the same day the Senate will likely make a final decision on Kavanaugh's confirmation. And Daines' vote could be critical. Daines has released a statement saying a fellow Montana Republican, Rep. Greg Gianforte, has come to "save the day," offering to lend Daines use of his private plane if he needs to return to Washington Saturday. "I appreciate his generosity as well as his dedication to family and country," Daines said in a statement. Daines spoke with Kavanaugh Thursday night to assure him he had his vote. Here's a roundup of how some of the lawmakers who have been most vocal in the Kavanaugh confirmation process have been reacting on social media. BREAKING: There are now 30 hours until a final vote on Judge Kavanaugh’s nomination to the Supreme Court. Don’t stop calling your senators and telling them to vote NO. Keep up the fight. Today, we can send a message to the American people that some core principles remain unfettered by the partisan passions of this moment. Facts matter. Fairness matters. Sen. Jeff Flake, R-Ariz., says "unless something big changed" he will be voting yes for Judge Kavanaugh. Flake admits it was "obviously a tough decision" he had to make, but claims he and his colleagues did their "best." Senate Republicans needed Flake, a key swing voter, to help confirm Kavanaugh for Supreme Court Justice. Sen. Lisa Murkowski, R-Alaska., would not confirm whether or not she is voting in favor of confirming Judge Brett Kavanaugh. However, she did offer a glimpse into the factors she's considering – the credibility of the institution. Murkowski also suggested Kavanaugh may not be the "right man at this time," ABC News' Ali Rogin reports. "I have been wrestling with whether or not this was about qualifications of a good man or is this bigger than the nomination. And I believe we are dealing with issues right now that are bigger than a nominee and how we ensure that our institutions not only our legislative branch but our judicial branch continue to be respected," Murkowski said. " I believe Brett Kavanaugh is a good man. I believe he is a good man. It just may be that in my view, he’s not the right man for the court at this time." Murkowski plans to compose a written floor statement with further detail. She admits this process has truly been the "most difficult evaluation" that she's ever had to make. As ABC News' Chief White House Correspondent Jon Karl pointed out during the network's live coverage of the cloture vote, the nation is headed toward the most polarized confirmation vote for a Supreme Court nominee in U.S. history. If the Senate votes Saturday as they did Friday on cloture, 51-49 would be the narrowest margin of confirmation for any justice in more than 130 years. Senate records suggest Justice Stanley Matthews in 1881 was confirmed by the closest vote to date – 24-23 – though the Senate of course was far smaller then, ABC News Supreme Court analyst and contributor Kate Shaw points out. Clarence Thomas was confirmed in 1991 by a final vote of 52-48, including 11 Democrats in favor. That is the narrowest margin for any Justice currently on the high court. Other close confirmation votes were for Justice Lucius Lamar (32-28) in 1888 and Justice Nathan Clifford (26-23) in 1858. The division seen in the U.S. Senate seems to be reflective of the highly polarized, partisan dynamic that has defined politics in recent years. Not too long ago, it was the norm for Supreme Court nominees to be overwhelmingly confirmed, ABC News' Senior Washington Reporter Devin Dwyer notes. A source in California professor Christine Blasey Ford's camp said she did not watch the vote to move Kavanaugh forward, ABC's Trish Turner reports. Ford, who accused Kavanaugh of sexual assault, testified against the nominee last Thursday in front of the Senate Judiciary Committee. Sen. Jeff Flake, R-Ariz., Sen. Joe Manchin, D-W.V., and Sen. Susan Collins, R-Maine all voted yes on moving Kavanaugh forward. Sen. Lisa Murkowski, R-Alaska, voted no. Both Collins and Murkowski were greeted as celebrities it seemed just after the vote. Senators from both parties came over and shook their hands, ABC News' Trish Turner reports. Democrats, in particular, wanted to shake Murkowski's hand. Sen. Maria Cantwell, D-Wash., passed Murkowski a note. In a dramatic midmorning vote, members of the Senate voted to move President Donald Trump's embattled Supreme Court nominee Brett Kavanaugh forward for a final vote. Sen. Lisa Murkowski, R-Alaska, a key vote, opted not to move the nominee forward. A group of sexual assault survivors, including a gathering of Native American women – a vital voting bloc in her district – had urged her not to move forward with Kavanaugh. BREAKING: "The motion is agreed to." Manchin said he would likely be "undecided" until he walked through the Senate doors, ABC News' Mary Bruce reports. The president took to Twitter to hail the move. Sen. Susan Collins, a moderate Maine Republican, is expected to vote yes on an upcoming procedural vote to move Judge Brett Kavanaugh's Supreme Court confirmation forward to a final Senate vote. However, she plans on announcing at 3 pm how she'll ultimately vote, a senior source with direct knowledge confirms to ABC News' Trish Turner. (Alex Brandon/AP) Sen. Susan Collins arrives to view the FBI report on sexual misconduct allegations against Supreme Court nominee Brett Kavanaugh, on Capitol Hill, in Washington, Oct. 4, 2018. A parade of lawmakers took to the floor to make their case for or against Brett Kavanaugh's Supreme Court Justice confirmation. Sen. Chuck Grassley, chairman of the Senate Judiciary Committee, declared that voting for Kavanaugh is "voting no to mob rule." "We should all admire Kavanaugh's willingness to serve his country despite the way he's been treated," Grassley said. Meanwhile, Senate Minority Leader Chuck Schumer declared: "President Trump's nomination of Judge Brett Kavanaugh to the United States Supreme Court will go down as one of the saddest, most sordid chapters in the long history of the federal judiciary." 9:00 am: A wedding day vote? In a turn of events that seems ready-made for a rom-com, Republican Sen. Steve Daines, of Montana, plans on walking his daughter down the aisle on Saturday in their home state – the same day as the planned vote on Kavanaugh's confirmation in Washington D.C.
His spokesperson tells ABC News' Ben Siegel that the senator supports Kavanaugh and has done so throughout the entire process. Donald Trump Jr., the president's son, seemed to think Daines would be able to make the vote. Senators spent Thursday weaving in and out of a secure room on Capitol Hill, called a SCIF, where the FBI report was available for review. The report included more than 40 pages of interviews, which all 100 senators were able to access in rotating time blocks beginning at 8 a.m. Speaking on the Senate floor, McConnell said there would be "plenty of time" for senators to review the material before Friday's cloture vote. If Republicans don’t have the votes to cut off debate on Friday, it cannot move forward to a final vote. Standing in Kavanaugh's way are a handful of key swing votes. The group of moderate senators who could ultimately make or break his nomination includes Sens. Jeff Flake, R-Ariz., Susan Collins, R-Maine, Lisa Murkowski, R-Alaska, and Joe Manchin, D-W.Va.
Flake and Collins, while saying they are still undecided how to vote, indicated they were satisfied with the FBI's additional investigation, comments the White House would find encouraging. Their votes will likely hinge on what is in the FBI's report. Kavanaugh's confirmation process has been rocked by multiple sexual misconduct allegations, all of which Kavanaugh has vehemently denied. What was the FBI directed to investigate? The FBI was directed to look into "credible" allegations of sexual misconduct made by Christine Blasey Ford and Deborah Ramirez against Kavanaugh. The White House specifically requested FBI interviews with four people: Kavanaugh's high school friends Mark Judge and P.J. Smyth; Leland Keyser, who Ford claimed was at the party where the alleged assault took place; and Ramirez, whose lawyers provided a list of more than 20 additional witnesses to interview. Ford claims Judge was in the room when she said Kavanaugh assaulted her. The FBI also interviewed Christopher "Squi" Garrett, another classmate of Kavanaugh's who appeared on the July 1 calendar entry. The White House received the FBI report Wednesday night, according to a statement by deputy White House press secretary Raj Shah. "With Leader McConnell’s cloture filing, senators have been given ample time to review this seventh background investigation," Shah said. "This is the last addition to the most comprehensive review of a Supreme Court nominee in history." The report has not been released to the public. McConnell has insisted that it remain private. As lawmakers emerged from the secure room Thursday, some Republicans said they would be outright yes votes for Kavanaugh, while Democrats suggested the White House had tied the FBI's hands by not allowing more witnesses to be interviewed. Sen. Richard Blumenthal, D-Conn., claimed the White House had "straightjacketed this investigation." On Thursday evening, the embattled judge defended himself in an op-ed in the Wall Street Journal. Under the headline "I Am an Independent, Impartial Judge," Kavanaugh wrote: "I was very emotional last Thursday, more so than I have ever been. I might have been too emotional at times."